Sometimes dinner is so good that I look forward to leftovers. Today's are the southern remainder of yesterdays' rillesapopin LPOD, and the same theme continues. I never appreciated how many rilles of all types there are around Humorum. Start with the two floor fractured craters Vitello and 3/4th rimmed Doppelmayer on the upper left. Bending across the middle of the image are the three massive curved rilles - the famous Hippalus Rilles that mark the cracked edge of the mare subsidence. If you look closely you'll see eastward extensions that aren't commonly captured. 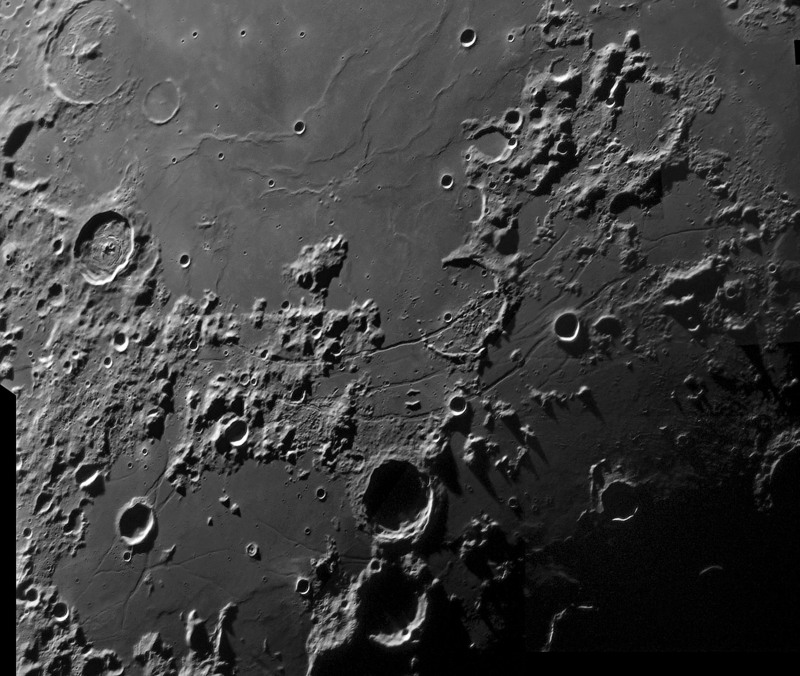 Near the bottom left are the Ramsden Rilles, one of the more complex intersections of troughs on the Moon, shown in exquisite detail, with the concentric crater Marth nearby. The final rilleful zone includes Agatharchides and its ruined satellite P near top right. The rilles cutting their floors have nothing to do with them, but are continuations of ones to the southwest. Here is this image in its glorious entirety, with Nick's processing. 15th August 2009, 05:29 and 06:12 UT. C14 and Lumenera Infinity 2-1M camera. This page was last modified on 20 January 2019, at 02:03.